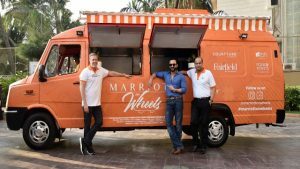 Marriott International Inc. recently made a uprising announcement to launch Marriott on Wheels – its first-ever mobile and portable food truck in India. Starting the voyage from Mumbai, the Marriott food truck will be seen travelling across six major foodie destinations in India, serving its patrons signature dishes and local favorites from Marriott properties. 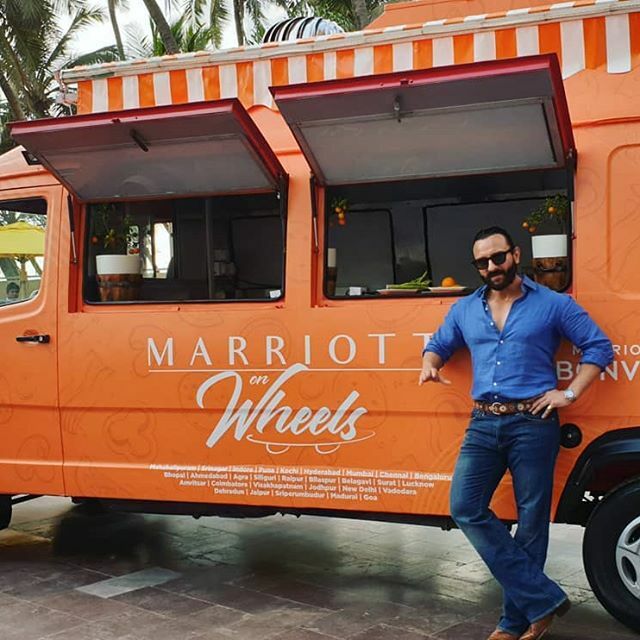 The food truck had been inaugurated in Mumbai by Mr. Craig Smith, President and Managing Director, Asia Pacific, Marriott International and Mr. Neeraj Govil, Area Vice President, South Asia, Marriott International along with Bollywood Actor Saif Ali Khan. Travelling through the cities of Ahmedabad, Amritsar, Lucknow, Pune, Madurai and Kochi, this food truck will be covering a distance of 6761 km over a period of 40 days. Through this initiative, Marriott International Inc. main goal is to manifest on the F&B strength of its Select Serve Brands – Courtyard by Marriott, Fairfield by Marriott, Four Points by Sheraton and Aloft Hotels. Marriot on Wheels are spending at least two days in every city, Marriott on Wheels will be easily located at some of the most famous hubs, such as, Food Truck Park in Ahmedabad, Sahara Market Plaza in Lucknow and Info Park in Kochi. Upon its arrival in the city, an Executive chef from a Marriott property will be present on-board, serving a limited edition menu, specially curated for the food truck. Some of the dishes served on-board would include Mutton tikka quesadillas which will be available in Amritsar, Karaikudi chicken wings in Madurai and Kosha mangsho kathi roll in Pune to name a few. “Munching on fresh, interesting and reasonably charged street food is a very contemporary thing outside India. Keeping our tradition alive of bringing new concepts in the food and hospitality, we are pleased to offer this relatively new concept of Food Truck in PBC which is already so popular among the youth. We are happy that our patrons for whom sitting, meeting and enjoying at PBC is almost a ritual, are already liking and appreciating the concept very much “, said Executive Chef Mayur Tiwari, JW Marriott Pune. The recently launched Food Truck is operational from 5 pm – 9 pm on Fridays, Saturdays, and Sunday and features a New York style street food menu with Hot dogs, Sandwiches, Burgers, and Fries. In the months to come, the menu will keep changing and patrons will get to enjoy a variety of street food from all over the world. Indoor as well as outdoor seating facilities are available.